Does the Larsen C ice shelf in the Weddell Sea collapse? Home → * Antarctic News → Does the Larsen C ice shelf in the Weddell Sea collapse? In the beginning of January, British researchers notified on the current situation of the Larsen C Ice Shelf. This ice shelf is located on the East side of the Antarctic Peninsula. A well known and observed crack has grown quickly larger during 2016. The German Alfred Wegener Institute reported about that topic during the last few months on its Ice Blog. Between May and August 2016 the scientists observed an extension of a crack by 25 km. In December this crack expanded another 18 km. 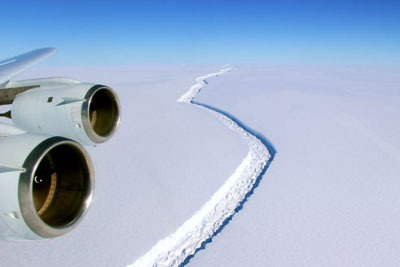 The anterior part of the Ice Shelf is now only connected to the remaining Shelf by a 20 km wide “bridge”. The British Antarctic Survey experts suppose a possible break-off scenario of the approximately 50,000 km² shelf ice area already later this year. In recent years, researchers have given special attention to the “Larsen C” ice shelf. The earlier collapses of the Larsen A (1995) and Larsen B (2002) Ice Shelves had clearly shown one effect: The floating ice acts as a barrier and slows down land based glaciers behind. The loss of such a barrier results in the acceleration of glaciers behind it. Larsen C covers an area about 15 times larger than the 2002 lost ice of Larsen B. Thus it also holds back larger glaciers masses. Two questions are interesting in that context: What causes the break-off of the ice shelf? And what are the consequences of the ice loss? Scientists have gained a lot of new knowledge about the underlaying processes of the loss of shelf ice during the last years. The collapse of Larsen B was most likely the result of the increased annual temperatures on the peninsula over the past 50 years. During that period of time the researchers have shown an average increase of 2.5 degrees. As a consequence of the warming, the snow layer and the firn layer on the ice shelf vanished more rapidly during summer. Thus melt water ponds evolved more frequently. These lakes froze during winter. Ice of this origin is warmer and softer than the surrounding ice, which has been formed by the transformation of snow to firn to glacier ice. The melt water zones in the glacial ice change the structure of the entire ice shelf. The following summer these zones will start to melt earlier. This effect caused the sudden collapse in Larsen B in 2002. For the detachment of Larsen C this effect is not the only reason. The results of the BAS studies show a declining firn layer and a decreasing thickness of the snow layer, due to an increased annual air temperature of the area. Further ice loss occurs at the bottom of the ice shelf by warmer water currents. The warming of the earth’s atmosphere and the Antarctic ozone hole strengthen the West wind currents and thus the circumpolar current. This gives enough energy to swash up warmer and saltier water masses from the ocean depths to the continental shelf. The scientists calculated the thinning of the ice to 4 meters, in the period of 1998 and 2012. What would be the consequences, when Larsen C will disappear? The shelf ice itself has no impact on the sea-level, since shelf ice is floating ice. However, there would not be any other barrier for the land based glaciers behind. They will increase their speed. In the case of Larsen B the surrounding land based glaciers accelerated five times their previous velocity. These glaciers lost a lot of ice, cracked, thinned, and retreated. Meltwater ponds on top of the glaciers, drained into the new cracks and weakened the glacier ice. In a similar scenario for Larsen C, the researchers predict a contribution to the global sea level rise of 50 cm until the year 2100, which will be a challenge for many coastal cities. Crack in the Larsen C ice shelf. Photo © John Sonntag, NASA. ← Lantern fruits in Antarctica?